I’m late with this bit of installment, and although Chinese New Year is finished, well I still thought I had to finish this chapter. We congregated for lunch at the Royal China courtesy of Emm Looi. It was also a big restaurant much like Oversea Restaurant the previous day. 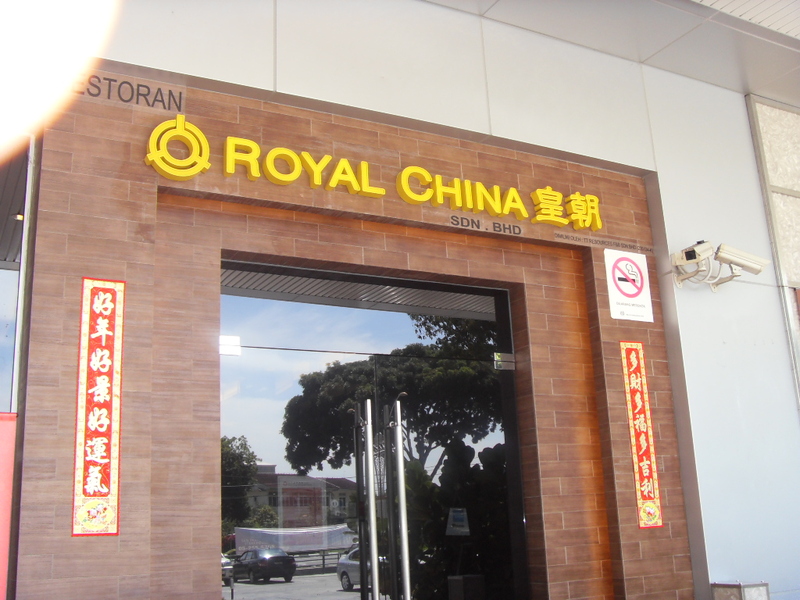 But somehow, Royal China had a much cosy feeling and it was more welcoming for some odd reason. This was probably due to the décor and the ambience and probably the location. Once again we were probably the first three table of the afternoon, so all eyes were on us. So Emm Looi ordered and we started out with Yee Sang. My first for this year. So today instead of a review, lets do a step by step of serving Yee Sang. Better late then never right! 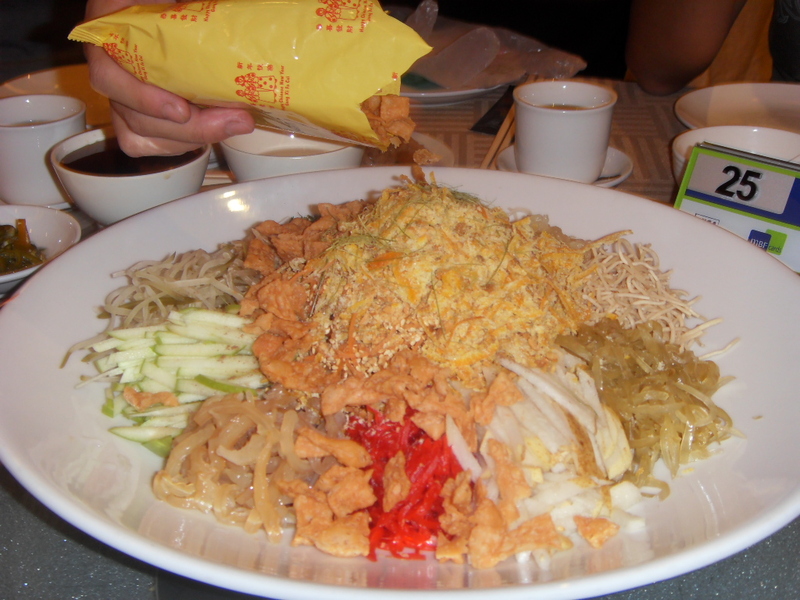 So out comes the platter laden with crispies and jelly fish, and other preserves as well as half a green apple and a Nashi Pear which are both julienned so they are all the same size as the rest of yee sang fare. There are bits of carrot as well underneath. On top of it all was peanuts, sesame seeds and thinly thinly sliced kaffir leaves. This seems to be a trend over the last 10 years or so I think. And if you look close enough you’ll also see bits of orange peel. Now for some reason when I make it at home I forget the orange peel. My home made yee sang is the usual crispies but I try to make it healthier by adding carrots and lettuce. So next time, orange peel as well. So now our waitress gracefully sprinkles over the 2 sachets of powder which is pepper and five spice powder. Well I think it is five spice powder because that is what they use here in PJ and KL. This has to be done gracefully, high enough for us to see, but low enough so the pepper won’t hit us and cause a bout of loud sneezes. Then she pours the more crispies. This one is just flavored flour deep fried. 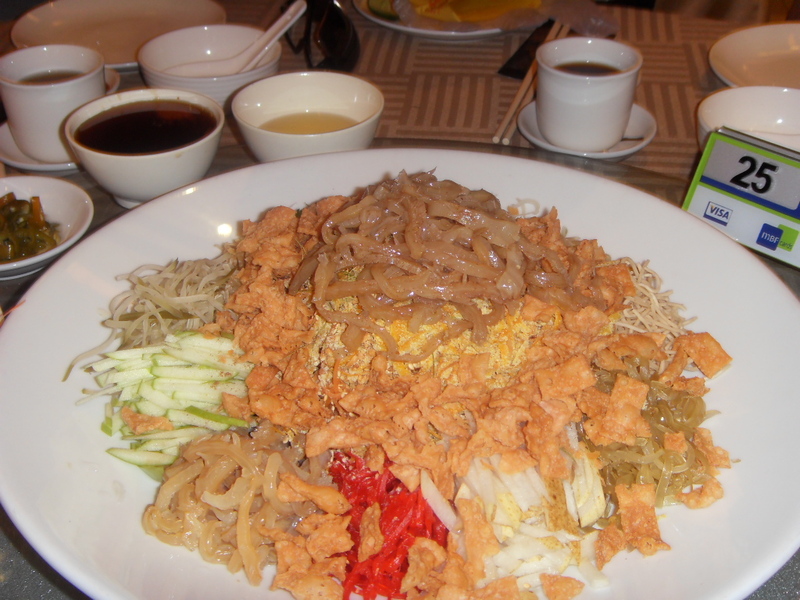 Now this is the part of Yee Sang that I don’t like very much. 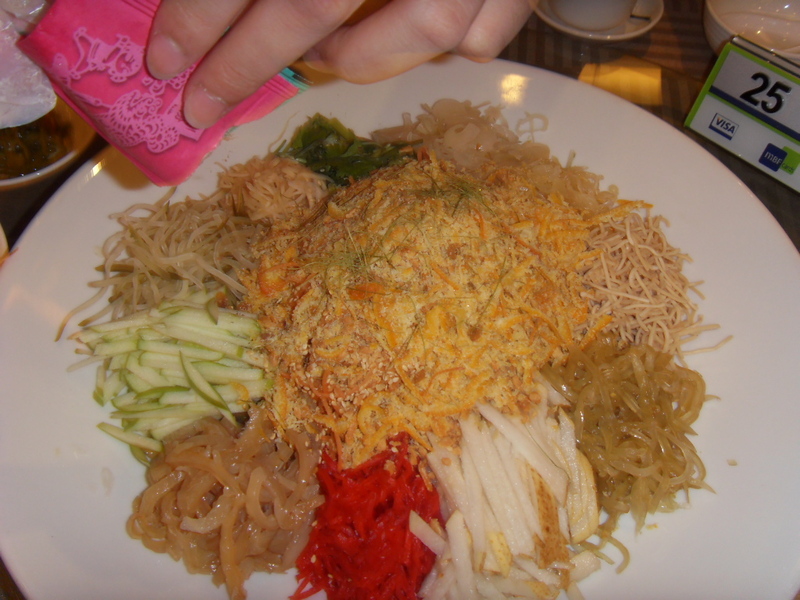 Ok let’s face it, Yee Sang is not exactly the most healthiest of meals, but really it can be healthy without the crispies and all. Anyhow in KL and PJ, sometime these crispies has a tinge of curry powder added to it. 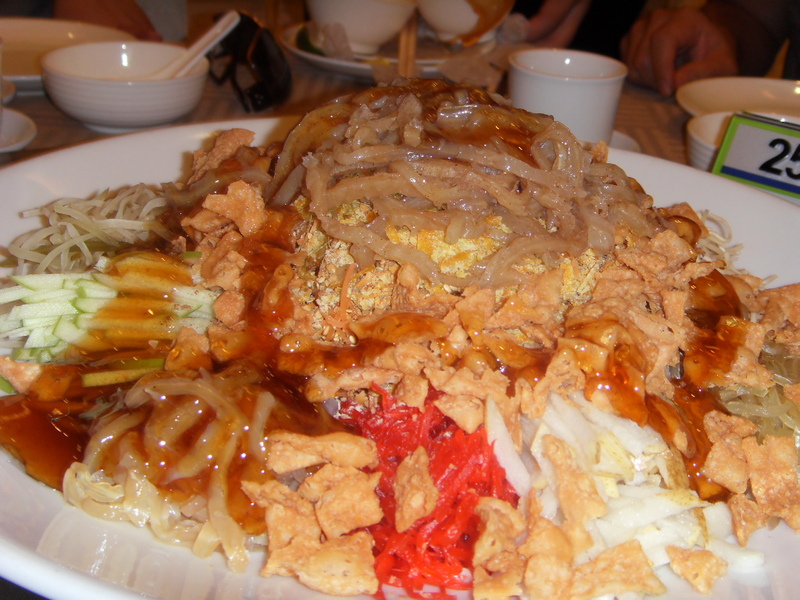 Now more jelly fish, or if you had salmon, that will be added on the top, this is the luxury part of the Yee Sang, the part that promises prosperity. Notice too, the plate is still clean, nothing is out of place. Then you pour the piquant tangy sauce, which is made of plum sauce, maltose and sugar. I usually add in some lemon juice to give it a less sweet taste. You have to pour it with grace and some style of course. And now Ladies and Gentlemen… let us Lou Hei… and notice the mess we make. 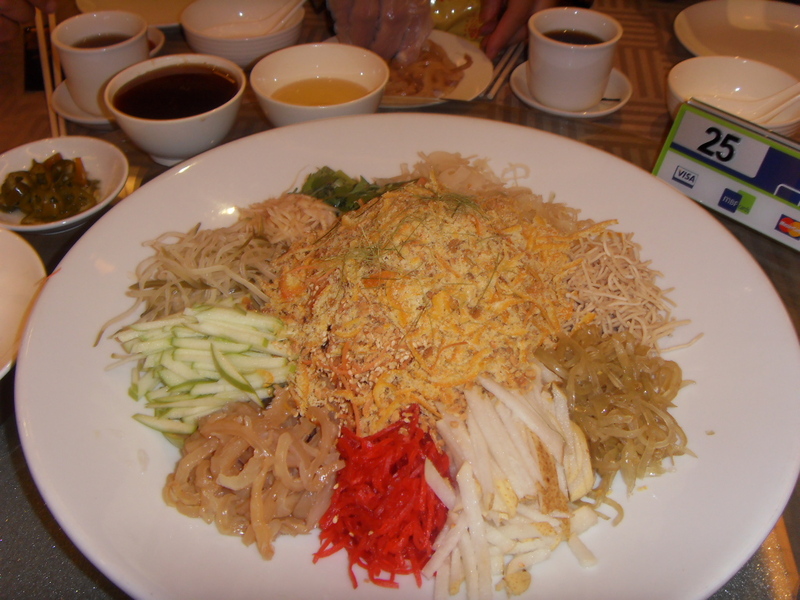 I must say t he Yee Sang here in Ipoh was much finer then the one I have had in KL and PJ, possibly too is the fact that I did not eat it in a swanky place like Royal China. 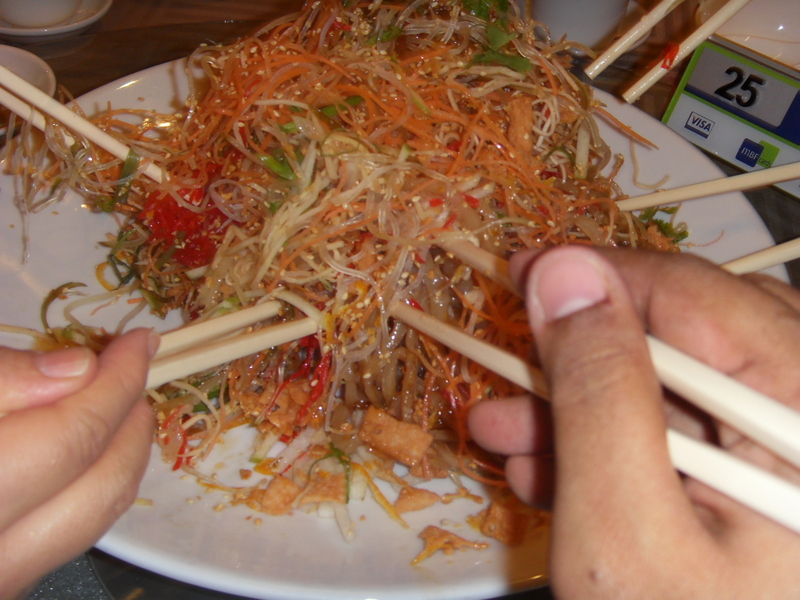 The fresh salad, and mind you Yee Sang is suppose to be a salad came from the fruits, and the carrots, a very nice mild combination, with the different textures and tastes. We had dim sum after that, and a half duck which I must say was actually very very good. It was succulent, it was not ducky, and frankly I could have taken the last few pieces had I not been new to the town. I must admit, ever since I had duck in Ipoh, somehow Duck in PJ just does not taste the same. We had Duck last Sunday for Aunty Mary’s birthday, and for some reason, it was just not as good. Next topic, FIND THE BEST DUCK IN KL AND PJ. 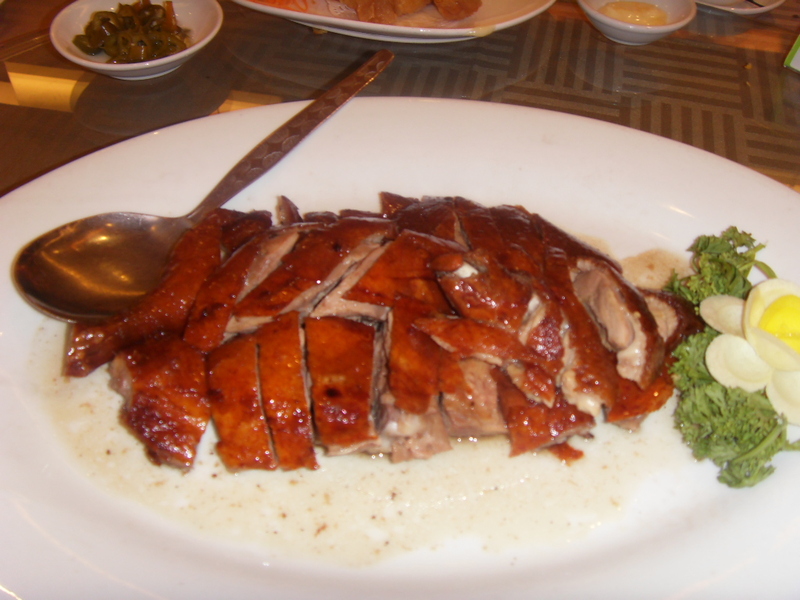 We will however not include Duck King at the moment because I have to say their duck is pretty awesome. Only their duck! Finally I’d like to thank Emm Looi, if she ever gets to read this, Seok Hean and Eddie, the ever graceful Mrs Teoh and the No Nonsense Kitchen Goddess herself, Ah Yoke Cher who taught me how to fry ngaku properly, and a myriad other Ipoh Specialties. Thank you so much.